While I was waiting for patch 3.0.2 to arrive, one of the things I did was farming reputation – for fun, and for the achievements. I got myself Exalted with all five Alliance factions, Exalted with Cenarion Circle and Argent Dawn, and I’d farmed 34K rep of the 39K I needed for Exalted with Timbermaw Hold. Off I trot today to finish off Timbermaw rep and get myself not one but two Achievements (plus a new title) – and I discover the rumor was right. Timbermaw faction handins now give twice as much rep.
Oh, furbolgs, why couldn’t you have been this easy to please a fortnight ago? There’s a lot of stuff in the game that requires farming, and farming is pretty tedious by itself. You can skip it if you want, but you miss out on quite a lot like that. So, here are a few tips and tricks. 1. Break the job into chunks. Don’t try and fish yourself from 300 skill to 375 in a day. It’ll seem like a dishearteningly mammoth task, you’ll burn yourself out, and never pick up your fishing rod again – not much point in having 375 skill at that point, is there? Instead, just say to yourself “I’m going to get 5 skill points on this fishing trip before I log off and play that alt instead.” Do that, and do another 5 points later in the evening. You’ll get your 75 fishing skill within a couple of weeks, and you’ll still be fairly sane to boot. Apply the same principle to anything you’re farming – “just another 10 drops and I’ll go”. Take a look at what your goal is, and work out how you can get incidental benefits. Farming Consortium rep? 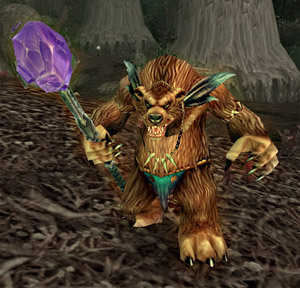 Why not kill the Ogres in Nagrand for their warbeads – they drop Crystal Powder Samples for Halaa token rewards (like an 18-slot bag), and they give Kurenai/Maghar rep with every kill to boot. I hit exalted with Kurenai solely through Consortium rep grinding. Trying to level your fishing skill? Why not fish up, say, Deviate Fish in the Barrens? They still sell very well on most servers (especially if you have the recipe to cook them yourself), they’re easy to fish, and you still get skill points for them. Trying to get Dampscale Basilisk Eyes to go from Aldor to Scryer alignment? Cut a deal with a friendly caster who might like to buy all the Chunks o’ Basilisk you’ll wind up with – those things make great spell damage buff food. Be creative and opportunistic to see what else you can get out of it when you’re farming for a specific goal. Also, be openminded about ways to reach your goal. For instance, I was having troubles with Scryer rep – I was trying to farm for Sunfury Signets, but as a holy pally I found it hard to kill the blood elves fast enough to get a decent rate of return. So I switched back to farming for Aldor rep items off the various demons in Netherstorm – the increased DPS I could get from my demon-specific damage spells turned frustration into ease (not to mention the fact that unlike blood elves, demons don’t run away at 10% health to fetch five buddies). On my server, you can trade Aldor and Scryer items at a 1:1 ratio in the trade channel, so I just farmed for Aldor items, traded them for Scryer items, and handed them in. Presto, exalted. No matter how efficient you are, farming is boring because it takes very little mental effort. So, distract yourself. I find podcasts work really well for this purpose – a farming session is about the only time I listen to podcasts, but they certainly do the job nicely. Other people I know recommend audio books. If you have friends you don’t see very often, hop on Skype or an IM service that allows voice chats, and natter away with them. A friend of mine on the other side of the world talked me through the killing of about 789235238 ogres for my Consortium rep – he works from home and keeps funny hours, so we’d power up iChat and voicechat for hours at a time… I barely even noticed the ogres falling under my mighty hammer.